One of the biggest challenges to capturing beautiful, polished videos from a multi blade rotor aircraft drone is the camera shake. Even on a light wind day, there is always the Drone rotor turbulence to contend with. If you are filming with a GoPro HERO4 and using a Phantom 2 drone with multi-rotors, then the DJI Zenmuse H4-3D Gimbal is the perfect answer. The 3-axis, brushless camera motor gimbal corrects any sudden movements for pitch and roll, allowing for tilting -130 degrees to +45 degrees. The H4-3D drone gimbal powers up from the drone’s flight battery and the installation uses the Phantom 2’s integrated GCU (Gimbal Control Unit). Additional GCU’s can be purchased separately for different models you might be using. The DJI Zenmuse H4-3D Gimbal is also compatible with WooKong-M, A2, Naza-M V2 and the Naza-M. Setting up the Gimbal comes down to attaching the Zenmuse H4-3D to the Phantom 2 drone itself and connecting your GoPro HERO camera. This set up stage will require some good motor skills, so you will need to be prepared for it, although it should be all completed within about an hour. Other things to keep in mind when you are looking for the perfect quality shots is the angle range of the gimbal. The Zenmuse H4-3D will keep the footage almost perfectly level at 360 degrees. Even when the drone is out of sight, they both work in unison to bring you breath-taking imagery. The battery life on the Gimbal should last well over 4 hours of flying time, and for a drone gimbal this is great. When you see the footage, all the work needed for connecting everything up is almost forgotten. The DJI Zenmuse H4-3D Gimbal is literally operational straight out of the box. All the latest firmware has been already added to the device. The gimbal has its own built-in IMU (Inertial Measurement Unit) ensuring that the camera stabilization is in sync with the drone’s movements. The IMU is constantly sending signals to the Zenmuse Gimbal at a refreshing rate of 100 rates per second, counteracting any force or movement your aircraft might encounter while in operation. This enables your footage to be motionless, steady and professional. The Gimbal is also extremely lightweight and very durable at the same time. With its strong Aluminium frame, ensuring you gimbal is and GoPro camera are safe and secure at all times. The last thing to touch on is the updates on the H4-3D Gimbal. Zenmuse are always updating the software on the Gimbal, maybe few times per year, but with a few clicks of the mouse, the Gimbal will be fully updated without any nightmares. The only little issues you might find yourself in, is the setup from Gimbal to drone and GoPro camera. Overall the DJI Zenmuse Gimbal is a fantastic device if you are looking for professional camera work. 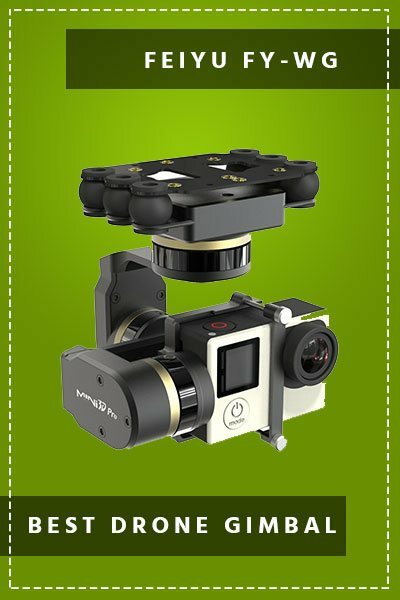 It is one of the easiest Gimbals to hook up to your GoPro camera and Phantom 2 drone, literally you will be ready to go about 15 mins after taking the gimbal out of the box. The price is around the mid to high-range as far as gimbals go, but it is well worth the investment. We think it’s one of the best camera stabilizers there is. If your setup is a Gopro Hero 4 and a DJI Phantom 2 drone, then the zenmuse H4 3Dis the perfect answer. The H4-3D Gimbal was the second one that I have used for my Phantom and I have to say what an awesome decision it was to make the change. I was nervous about making the change as the old gimbal worked well, but broke due to my incompetent flying and I was thinking of buying the same gimbal but really pleased I didn’t. For starters, it is a much better balanced gimbal than the previous one and the setup was straightforward enough. The camerawork is awesome and smooth. I managed to take some beautiful shots of a waterfall near my house and the weather was blustery to say the least! I would highly recommend the H4-3D gimbal for anyone with a Phantom drone.